Ancient stone walls delineate perimeters of past and present boundaries, an artistic contrast to the brilliant green carpeted hillsides above the deep blue shoreline of Sao Miguel. One of nine islands in the subtropical volcanic archipelago called the Azores, about 1500 miles west of Portugal, it is a hub for cruise ships and golfers. A short distance from the small airport is Porto Delgada where ships carry cargo, sailors, fishermen whale watchers and tourists from around the world. The Marina Atlantico Hotel has the best balcony views of the harbor activities and is a short walk from the Center Square and Iberian city life. Streets are narrow here mixed with concentrated shops and balconied tenements draped with flowers behind wrought iron art. Purchase anything from electrical adapters, perfume, or apparel to cars.”Just look for the big cow sculpture and you are there,” they say. Cows? They appear on everything for some reason. There should be no diet plan except the plan to “Taste Portugal” as the tourism slogan dictates. Port side restaurants like Esphinas serve local bounty such as triggerfish laced with mustard sauce and Azorean style steak. Bread and desserts are unbelievably tempting but usually accompanied by Carpaccio island pineapple. Dinner at the Colegio 27 Restaurant begins late with a live jazz band, Brazilian cocktails, and savory seafood, perhaps concluding in the early morning hours. The moon shines over the cathedral in the square on the walk back to the hotel. Dance the night away at a club or share a romantic evening on the private balcony with a voluptuous Portuguese wine, watching the moonlit waves, harbor lights and cruisers. A sunrise over the marina and a hearty breakfast buffet awakens the golfer for a day of play. The ride to Batalha Golf Club is a transport through time over the emerald green mountains splattered by black and white cows leaving city signs behind. Architect Mackenzie Ross designed an endurance test at Batalha as most players walk with a pull cart from hilltop to valleys, many with an incredible ocean view. The brilliant purple Morning Glory la ces the fairways along with other exotic vegetation. The game is tough but the scenery spells peace on this 27 hole layout where Cook pines and pampas grass intermingle. Add ten percent to the meter measurements for easy yardage conversion. Then add a club or two to reach the greens according to golf director Rui and confirmed by experience. On the A course hole 4 best represents the nine starting with weathered remnants of a stone habitat framing the tee box. An elevated sea view, green forested mountains penetrating the sky to the left, the short rock wall slithering all the way to the green, fairway bunkers on one side, ponds on the other, Kapalua, Hawaii meets Chiang Mai, Thailand. This is where the Ladies Access Tour played out when a tropical storm threatened the drainage of the flatter nearby Furnas Golf Club. While Furnas does not have ocean views, it is a horticultural wonder with artistic landscaping from rich blue hydrangea blossoms larger than heads, to exotic palms, and towering Japanese firs all beckoning our return to play. The third Azores course is on the island of Terceira, a short flight away. The Azores is an alluring golf destination for those who want to mix a couple challenging scenic courses with bio and cultural diversity. The Caldeira Hot springs has steaming pools which are too hot for bathing but perfect for underground cooking of corn an d stew. A light sulfur infusion contrasts with the floral aroma at Terra Nostra Garden in Furnas. Imagine an immense circular stone tiled swimming pool filled with yellow liquid. Get past the color and slip into the silky warmth of the thermal iron water. Gaze up at the sky and trees, sit under a concentrated hot waterfall to alleviate any physical neck, back and shoulder stress. This is a truly unique treat. Five euros buys the privilege of a towel, availability of changing rooms and garden access. The sense of well being is so pronounced, you may think your slice has been cured. The volcanic origins of the islands avail multiple settings for natural thermal bathing. Two guys from Toronto said they make an annual trek of their ancestral and medicinal bathing tradition. From the hot springs, the coastal highway leads to steaming tea at the Cha Gorreana Tea Plantation, the only one in Europe. Tour the factory operation and sample the brews, organically grown onsite. Mild and sweet, there is no need for milk and sugar. 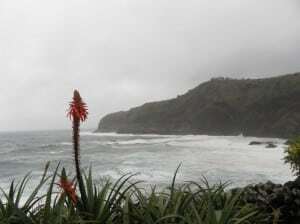 The surrounding sub tropical paradise with flowing green pastures slips into the crystal Atlantic for dramatic views. On the north shore of the island is som e of the best surfing areas on earth where the SATA Airlines Open competition attracts professional surfers from all over the world. For beach lovers, snorkelers and divers, the Bahia Palace Hotel opens up to soft black lava sand. The Caloura Hotel Resort is for lovers. Panoramic sea cliff views invoke romance. The grand dining salon has floor to ceiling windows to serve a 180 degree vista and culinary delicacies. The filet of steak au gratin with island fresh pineapple and shrimp will be attempted in the home kitchen. A blend of cream cheese, condensed milk and whipped cream with a dark chocolate crumb base passed the fabulous dessert test. Yummmm! 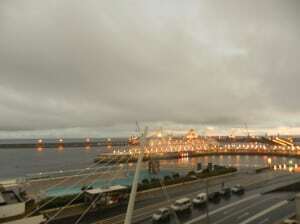 Absent on Sao Miguel is any sign of impoverishment that is evident in so many foreign islands. Mainly agriculture and tourism keep people gainfully employed and happy. There is a theme of preserving family busine ss and fun. 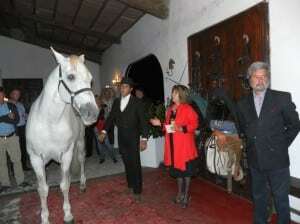 This is epitomized at Quinta de Pico de Cruz where a dancing horse and rider leads patrons in the dark through the long tree lined entrance to the stables for a cocktail greeting and introduction of the family – mother, father, sons and Lusitano horses. A traditional Portuguese dinner follows in an elegant yet quaint dining hall as wine pours freely. Then a fresh breeze blows in as the table side windows open to reveal a magical scene. A green arena sparkles against the dark mountain, culminating with a surprise late night show. The passionate music, harmonic partnering of man and equestrian athleticism put “Dancing with the Stars” to shame. If you were a cow, you would want to live here freely in the green pastures with ocean views and no predators. Farmers never herd them to stanchions, but bring the milking machines to them in the field. Thirty percent of the milk of Portugal is produced here along with cheeses that pair well with every robust bottle of fine Portuguese wine, all at moderate prices. The cow population is double the people population. If you are a travel loving golfer, break away from the herd and experience the udderly alluring Azores. Traveling Bostonian Bob Cecchini said, “The trip exceeded my expectations. The island is beautiful and the nice courses are a true test of golf.“ When, not if you want to experience the astounding beauty of the Azores, SATA airlines has a four hour direct flight from Boston. If you go by way of Lisbon from any international city, consider extra days there and or in Algarve for more great golf- but that is a future story. The beauty of the island is more than a sight, it is a sense. We sense a definite return to explore more.